Finance Minister Kim Dong-yeon said Thursday the government will sharply raise next year's budget in social overhead capital(SOC). 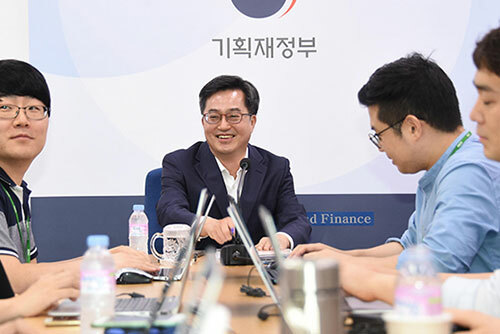 In a press conference at the Sejong Government Complex, Kim said that future innovation appears to be more related to urban revitalization and the housing sector than construction or engineering projects. He pledged to sharply raise next year's budget for SOC projects aimed at urban and housing improvements from this year's eight trillion won. Kim added that budget for conventional infrastructure projects will also be increased from this year's 17-point-eight trillion won the government had requested, saying those projects are linked to local economies. He said the two budgets combined will be larger than this year's budget allotted for social overhead capital. The finance chief, who also serves as deputy prime minister, said now is the time for aggressive fiscal spending and expected budget spending growth next year of more than the mid-seven percent range as previously announced.